Electronic Arts says The Old Republic drew more than two million beta testers and saw a quarter-million concurrent users over the Thanksgiving weekend. It's no guarantee of success but Electronic Arts seems encouraged nonetheless by the big number of users who turned up for a chance to take BioWare's upcoming Star Wars: The Old Republic MMO out for a spin. "The game itself has a huge pre-existing fan base," Eric Brown, EA's chief financial officer, said earlier this week at the Global Media and Communications Conference. "We had about 2.4 million people register for the Star Wars fan site, over two million of which volunteered to do [beta] testing for free." Over 725,000 unique users connected to the game over the Thanksgiving weekend, with each player connecting for an average of 12 hours over the three-day holiday. Peak concurrent user numbers topped an impressive 250,000. EA said back in February that The Old Republic would be profitable with as few as 500,000 subscribers, so two million testers has to be seen as a good sign. But as Brown said, the fan base is "pre-existing," and there's a big difference between drawing hordes of Star Wars nerds who want a free sneak-peak at what's being done to their favorite franchise and turning those same nerds into paying customers over the long term. 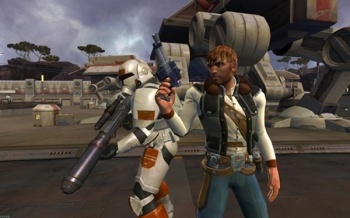 Star Wars: The Old Republic opens to the public on December 20.